With the Puppet Enterprise HipChat integration, users can start Puppet deployments and monitor jobs in real time as a team, right in HipChat. PORTLAND, OR--(Marketwired - Apr 7, 2016) - Puppet, the standard for automating the delivery and operation of the software that powers everything around us, today announced a new integration with Atlassian HipChat that will create more powerful and productive teams. The new integration between Puppet Enterprise and HipChat brings awareness, collaboration, and action to a single place. This increased awareness and collaboration will enable teams to deploy changes faster and with confidence by bringing greater transparency to the deployment process. "The hallmarks of DevOps and modern software delivery are automation, culture, and collaboration," said Nigel Kersten, CIO of Puppet. "ChatOps unites all of these principles, helping organizations communicate more effectively so they can solve problems and ship new features faster. This new integration with HipChat and Puppet Enterprise securely and simply connects people, processes, and tools in a single place, and we believe it will change how teams work and become a natural part of their daily workflow." Today, Puppet is announcing its collaboration with HipChat on new integrations that will result in more powerful tools for extending DevOps and modern software delivery practices to the enterprise. Popular in enterprise settings, HipChat is a team communications platform that provides persistent one-on-one chat, group chat, video chat, file sharing, and integrations. Teams that use HipChat are able to adopt ChatOps -- a collaboration model that connects people, tools, and processes in a single transparent workflow. This new integration makes it possible to direct change using the Puppet Orchestrator, see change as it occurs, and discuss changes in real time as a team, all directly from HipChat. Whether you are updating a fleet of VMs in the cloud or pushing out a new version of a distributed application with Puppet Enterprise, you and your team can do it all from the HipChat room your ops team uses to collaborate around infrastructure. Using this new integration, teams can take advantage of the benefits of ChatOps: better collaboration, faster feedback loops, and greater transparency throughout the deployment process. 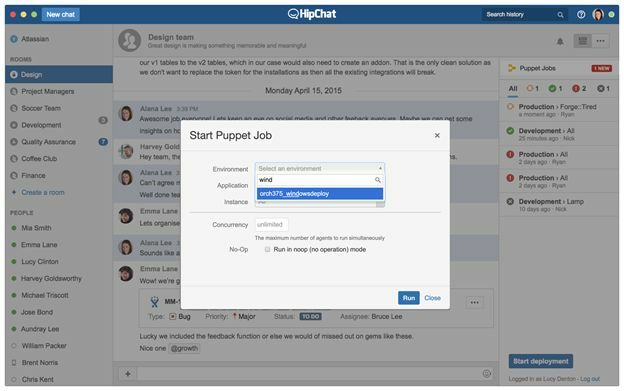 "Through HipChat Connect, customers can benefit from Puppet's new integration, which includes the latest direct-change orchestration capabilities to continuously monitor all deployments directly within HipChat," said Joe Lopez, head of HipChat engineering. "DevOps teams are now practicing ChatOps in HipChat, resulting in faster feedback loops, direct change control, and real-time collaboration." A preview of the Puppet Enterprise integration with HipChat will be available in the coming weeks. Sign up to be notified when it's available. Learn more about Puppet Enterprise 2016.1. Puppet is driving the movement to a world of unconstrained software change. Its revolutionary platform is the industry standard for automating the delivery and operation of the software that powers everything around us. More than 30,000 companies -- including more than two thirds of the Fortune 100 -- use Puppet's open source and commercial solutions to adopt DevOps practices, achieve situational awareness and drive software change with confidence. Based in Portland, Oregon, Puppet is a privately held company with more than 400 employees around the world. Learn more at puppet.com.